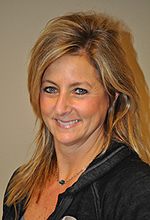 Lauren Angie is a managing partner at LJI Collision Center, Orange Village OH 44122 an independent collision center with a process centered environment and directional production flow. Leading and executing lean disciplines and principles with the beneficiary being the customer with quality and timely repairs at a competitive price. Our mission is to build confidence in every customer and ensure the quality repairs and superior customer service. Our commitment is to achieve and retain customer for life. When Angie isn’t managing LJI Collision Center, you’ll find her being a mom to her two sons and a wife to her long-time sweetheart, husband Fred. Besides her passion for work and family, she’s also passionate about riding her 17.2 hand high Dutch Warmblood – Angie rides with the trainer and competes FEI Level dressage.